Have you ever wondered what the phrase “Borrower is lawfully seised of the estate hereby conveyed and has the right to mortgage” under BORROWER COVENANTS meant? Glenn Augenstein, a seasoned researcher, history major and expert witness in foreclosure fraud, has taken the time to research the ancient word “seisin” which gives us better insight into what the mortgage document was meant to convey. This two-part post is worth the read and education – and may give you a new perspective on the intention of the documents and the necessity to defend the title at all costs. One case frequently cited by banks to support such rulings in the past three (3) years is Livonia Property Holdings, L.L.C., v. Farmington Road Holdings, L.L.C., 717 F.Supp.2d 724 (E.D.Mich. 2010), stating “Borrower disputes the validity of the assignment documents on several grounds outlined above. But, as a non-party to those documents, it lacks standing to attack them.” This information is readily available to the public on the Internet. It is significant that the same court held differently two (2) years later in another case. “It is true that the Livonia Properties opinion contains the statement that “there is ample authority to support the proposition that ‘a litigant who is not a party to an assignment lacks standing to challenge that assignment, ‘” Livonia Properties, 399 F. App’x at 102 (quoting Livonia Properties Holdings, LLC v. 12840-12976 Farmington Road Holdings, LLC, 717 F.Supp.2d 724, 736-37 (E.D. Mich. 2010)); but when read carefully the case does not stand for such a general and unqualified position. The Court believes, therefore, that Livonia Properties does not compel the conclusion that a foreclosure plaintiff can never attack the foreclosure by challenging the validity of an underlying assignment.” Talton v. BAC Home Loans Servicing LP, 839 F.Supp.2d 896 (E.D.Mich. 2012). Banks aren’t nearly as quick (heh, heh) to wrap their arms around this counter holding. Before making a mere layman’s attempt at providing answer(s) to potential questions raised above I’d first like to cover a bit of history in regard to conveyance of interests in, and ownership of, real estate generally. It is long standing, and well established, that someone ALWAYS owns land, and that such ownership be a matter of public knowledge, of the public record. “[W]e may now pause to wonder how transfer of these potentially infinite interests was accomplished. Without a modern system of land records, it would be desirable that the transfer be effected with sufficient ceremony not only to mark itself indelibly in the memories of the participants, but also to give notice to interested persons such as the mesne lord above the transferor. The central idea was to make ritual livery (meaning ‘delivery,’ from the Old French livrer) of seisin (meaning, roughly, ‘possession,’ from the Old French saisir or seisir). The transferor and transferee would go to the land to be transferred, and the transferor would then hand to the transferee a lump of soil or a twig from a tree — all the while intoning the appropriate words of grant, together with the magical words ‘and his heirs’ if the interest transferred was to be a potentially infinite one.” Thomas F. Bergin & Paul G. Haskell, Preface to Estates in Land and Future Interests 10–11 (2d ed. 1984). The ceremony was usually attended by witnesses. I imagine the bigger the parcel of land the more witnesses were in attendance. In the absence of a writing it was the ceremony and witnesses that created the public knowledge, and thereby the public record. 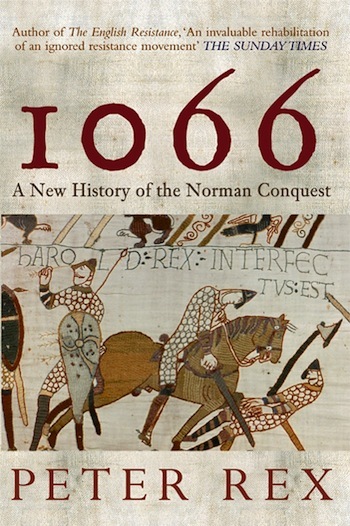 Though writing was rare a written “charter of feoffment” would occasionally be drafted. This might occur when the boundaries of a given parcel were particularly complex. Even when employed the charter would not by itself be the conveyance. The conveyance was the livery of seisin – and without same the charter was of no effect. Language utilized in charters helps to illustrate this point. It wasn’t “By this charter I hereby give…” Rather it was “Know ye that I have given…” Livery of seisin was the present tense ceremony of conveyance. A charter of feoffment was a past tense writing about an event that had already occurred. In the presence of a writing it was still the witnesses that created the public record. Who owns Blackacre? Jones owns Blackacre. How do we know Jones owns Blackacre? There were seventeen (17) witnesses in attendance at the livery of seisin in which Smith conveyed Blackacre to Jones. Livery of seisin was not abolished in England until 1925 with the passage of The Law of Property Act. 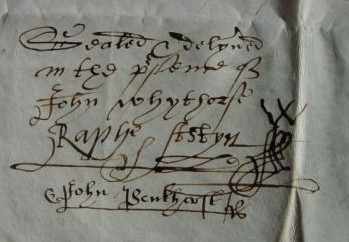 In the latter part of the seventeenth (17th) century a new method of conveyance and recordation was, out of necessity, developed; In the aftermath of the English Civil War in 1642-1651, a midst some confusion, there were efforts to game the existing system of livery of seisin, and to acquire some ill booten gotty, er.., um… ill gotten booty. The method employed was to hire a couple of contract perjurers to act as false witnesses, usually locals in good standing in the community, to come into court and offer perjured statements in regard to a land transaction . After several years it became quite clear what was occurring – crooked folks were hiring the best, most well thought of contract perjures they could find, and stealing properties across the countryside – and how the courts had become complicit, unwittingly or otherwise, in the fraudulent takings. 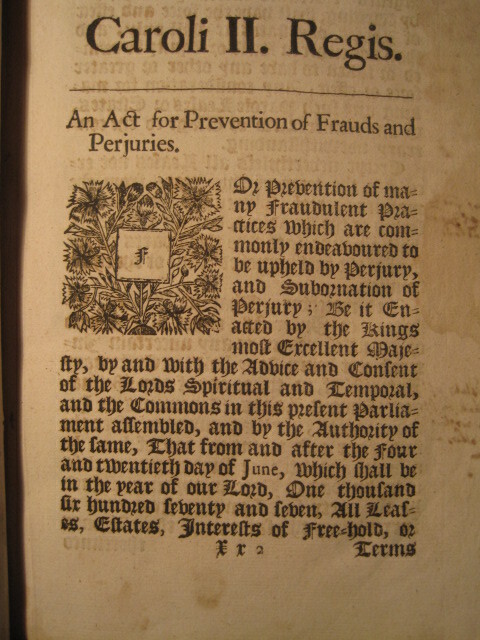 Enter the English Statute of Frauds of 1677. The important parts are relatively short. The emphasis is mine. The original § V is the portion relating to conveyances and sales of real estate. Between the “writing” and the “three or four credible witnesses” this resolved the problems of the contract perjurer. Now it becomes the writing that effectuates the conveyance. The Statute of Frauds brought back some stability and reliability to land ownership, and private property rights. It was utilized in America before independence. Recording statutes also grew up around the Statute of Frauds. After independence the same Statute of Frauds was retained by the founders, and the land recording systems and statutes as well. Every state has adopted a similar version of the original English Statute of Frauds into its own statutes. For centuries this system worked quite well. Until the last decade or so. But now those with bad intentions have discovered ways around the requirements of the Statute of Frauds. Perjured testimony in court as the only proof doesn’t cut it any more. What is required is an executed writing that also lies. We’re now dealing with rampant contract perjury, and contract forgery. It is utterly insane. The astute recorders, of which there aren’t many (John O’Brien, Kelley Monahan, Curtis Hertel, Jeff Thigpen, Phil Ting [forgive me if I’ve left any out]), liken their recorders offices, and records, to being a crime scene, and that seems to be accurate. Part 2 to follow shortly. Follow this post for Part 2 – How to Challenge an Assignment of Mortgage. Have you signed up to follow DeadlyClear? See the top right-hand sidebar and enter your email address to receive new posts. It’s FREE – and you won’t want to miss the next one. Part 1 – How to Challenge an Assignment of Mortgage is as popular as Part 2. The author has been a terrific researcher and paralegal assistant from whom we have all benefited. This entry was posted in Foreclosure Defense and tagged BORROWER COVENANTS, charter of feoffment, contract perjurer, Conveyance, Curtis Hertel, Deeds, English Civil War, Farmington Road Holdings, Fraud, Glenn Augenstein, Jeff Thigpen, John O'Brien, Kelley Monahan, Livery of Seisin, Livonia Properties, mortgage, Norman Conquest, Perjury, Phil Ting, seisin, Statute of Frauds, Talton v. BAC Home Loans Servicing, The Law of Property Act by Deadly Clear. Bookmark the permalink. Excellent well written beginning historical analysis, yet in truth in modern day law most judges are ignoring the simple basic threshold requirement that a foreclosing mortgage AS A PART OF ITS INITIAL BURDEN OF PROOF must show that it has the right to foreclose in the first place, meaning that it owns the loan (the note and the mortgage, usually but not always indivisible), notwithstanding however informative my be any historical hocus pocus, perhaps the point to be covered in Part 2. Mr. Dubin – I am most interested in your statement that the note and mortgage are usually, but not always, indivisible. What authority? What state are you in? I am in New York. This is a crucial issue for me. Thank you for your thoughts. Well Well as usual history repeats itself. We have has stolen property by fraud witnesses since at least the 1600’s and I am sure from a well documents video called the Wizzard of Oz since the days of Caesar. 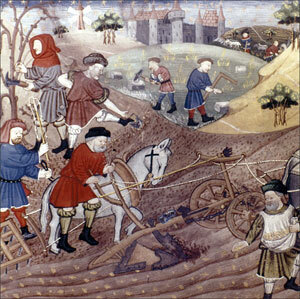 This crime of land grab and property theft is not new, Due to the web world it has vast exposer in modern day times. So egregious and on such a large scale this theft can not be ignored nor allowed. Hmmm must be one of the oldest jobs in history. Testing to a fraud transfer of ownership of property and prostitution must be the two oldest professions ever, as old as time itself. MERS was the modern day tool used to conceal fraud and transfer. Glen just left my house, after showing where to find and read this. He is one of the most knowledgeable men in America when it comes to foreclosures, and it’s nice to know someone like him on a personal level. We talk about a lot of things and I always come away from it knowing something new, but whenever he needs help growing food he usually calls me haha. Today they made the threat that they would damage sabotage or vandalize the brakes on our car so they would “go out” “suddenly” This was such a CLUMSY INTIMIDATION caught on videotape that it is going to bury some of these people who appear to be too stupid to back away. This is a SYSTEMIC thing., Not something new. They’ve done this before. I think you may understand me as others do not ‘get it’ as the victims of Richard Rothfuss do. HE should choose his victims more carefully. I long to see your property. I feel it must be a lovely property just as ours is. Oh random thought “‘again. I didn’t realize this was such an old post until yesterday … I bet it’s getting tons of “hits” now. LOL. ANYONE AT ALL ON EARTH would or should be able to present a case of “fraud upon the court” whether it’s by assignment or outright perjury. 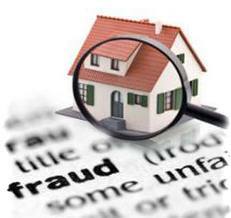 A victim of FRAUD is not necessarily a challenger of an assignment. You must CHALLENGE the assignment as a FAKE as you did. You’re kind of our hero you American man. I should clarify those threats stemmed from the same person here locally whom Rothfuss has employed to direct other threats our way. I don’t have to make the connections here. They laughably and DEFINITELY exist in public records. This local person is a “big man” in the county and VERY VERY connected and even perhaps familially (going by facial characteristics and names and events) with the court personnel involved including the man and men and others who blocked our access. It’s not a mysterious, nebulous “they” AT ALL. Quite well known in our community. Bet you have that same thing. Upon reviewing this list, I assure you that LSR had NONE OF THIS at any time. Or almost none of it. They did have that “assignment”…. 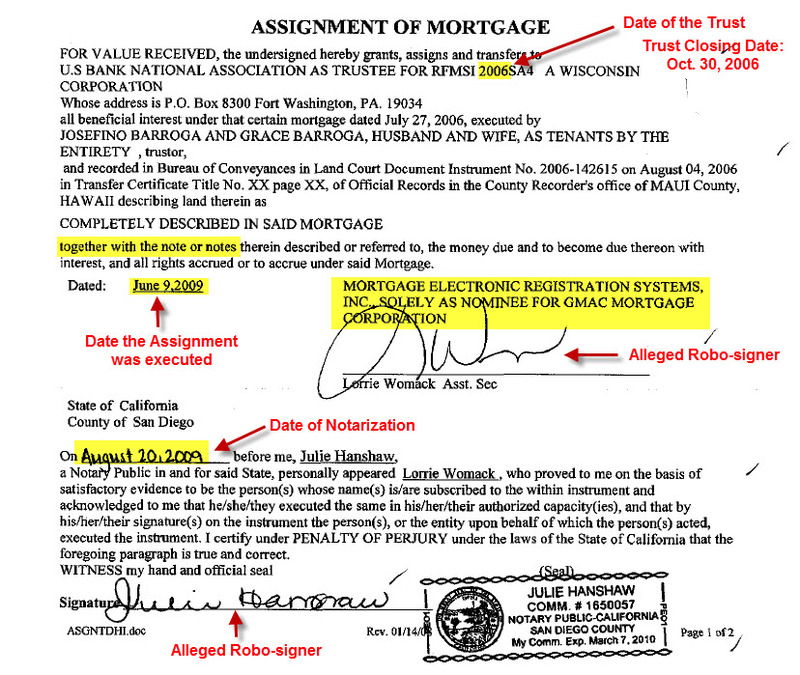 oddly dated OVER one and a half years AFTER our mortgage was signed NOT WITH the people they are suing for either. Lulz all over them.